Money-saving combo includes gallon plus a full 20 oz. bottle! If it's made of fabric or vinyl, Marine 31 Fabric & Vinyl Cleaner will make it look new again! Use on all marine fabric and vinyl surfaces including bimini tops and seat cushions. As soon as Marine 31 Fabric & Vinyl Cleaner makes contact with the surface it begins to break down grease, grime and mildew. This biodegradable marine cleaner safely removes the toughest soil and stains on virtually all marine fabric and vinyl surfaces. Use Marine 31 Fabric & Vinyl Cleaner to remove embedded mildew stains that no other cleaner will touch! If it�s dirty, Marine 31 Fabric & Vinyl Cleaner will make it look new again! Marine 31 Fabric & Vinyl Cleaner is harbor-safe and eco-friendly. Rinse surface to remove loose dirt and grime. 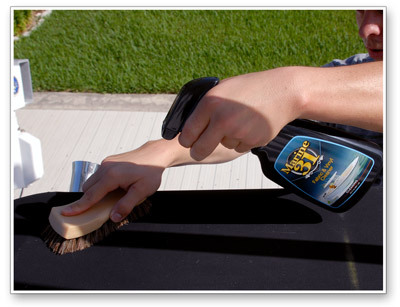 Spray an even amount of product directly onto WET surface and lightly scrub with an approved brush or terry cloth towel. For difficult stains, let product dwell for 20-30 seconds before agitating. Rinse thoroughly and follow with appropriate Marine 31 vinyl or fabric protectant. Includes 128 oz. and 20 oz. bottle with sprayer.